When Did Pro-Life Become Anti-Immigrant? It was posted in response to an article in our local paper about some of the immigrant children crossing the border being housed in foster care in our state. The message, of course, was that we should keep the unborn child and immediately deport the immigrant kid, who was obviously a gangster. It really bothered me, on a number of levels. First of all, if these kids were actually gangsters, they would just stay in their home country to join the narcotics trade that we fund with our insatiable appetite for drugs. And guys, immigrant children do go to our schools and frequent our emergency rooms, but despite what Fox News tells you, the Mexican family next store is almost definitely not stockpiling welfare benefits to fund a burgeoning drug cartel that meets in their basement. I think a couple of people just unfriended me for voicing my frustration with Fox News. But friends, I’ve got a Newsflash of my own: You can love America and love people who did not have the privilege of being born in America too. Like at the same time. The two are not mutually exclusive. Like my love for America does not have to be defined by my lack of love for undocumented immigrants. If I was starving or someone was chasing me, or it was the only way to support my family, and I was knocking on your door, and no one was letting me in, guess what? I would break into your house. Then I would ask you for help. And if you allowed me to stay, I would offer to do the cooking and cleaning, and maybe throw a little landscaping in there too. What can I say, my heart is a little bit Mexican… wah wah waaaaah. Guys, it’s not that simple. You don’t just fill out a form and wait your turn, because some people don’t get a turn – not in 5 years, or in a lifetime. We have several kinds of visas: Some are for family members of legal residents and citizens. Some are for visitors, who must have an American to sponsor them. So you have to know someone here. You can also get a student visa. Better be able to get into college and pay for it though. If you’re poor by international standards, that’s probably not an option. Ok, so what about a work visa? Most of those here illegally are here to work, right? What’s that you say? They’re here to get free stuff? OK, tell that to the Mexican immigrant who works construction all day, washes dishes at a restaurant all night, pays income tax, and doesn’t have the first clue as to how to access government benefits. Ok, so most of them are here to work. Well, to do that legally, you need to have great skills. Calm down, Napolian Dynomite. I’m talking about skills such as those described by our government as an “extraordinary ability,” “international acclaim,” or an advanced degree (beyond a baccalaureate) according to the United States Bureau of Consular Affairs. (If you think it looks complicated, imagine how it looks to someone whose first language is not English). There are some temporary worker visas for agriculture and other unskilled labor (like about 5 of them, I hear), but the catch is the company you plan to work for in the USA needs to file on your behalf first, so if you have no connection to the USA, obviously, no one is filing on your behalf. So what if you are one of the huddled masses yearning to breathe free, or perhaps the wretched refuse of your teeming shore? Well, unless you know someone who is here legally, have plenty of education (read: plenty of money), or have some kind of great skills (nunchuck skills, bow hunting skills, etc. ), your chances of finding a legal way to get here are slim to none. The government will, however, gladly keep your application fee. 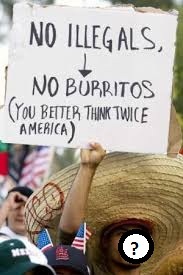 So we really need to stop blaming everything that’s wrong with our country on “illegals” (aka some of the most vulnerable people in our society) who should have just “got in line and come the right way,” because for the vast majority of people coming here illegally, there is no line to get in. They come because there is a demand for them, and they are vastly able to improve their lives and the lives of their families (by pulling mushrooms out of cow manure and sharing a room with 9 different people), and because we have not provided a legal way for them to fill that demand or better their lives. So, what was I talking about? Oh yeah, the image of the fetus with the rifle-bearing immigrant child. So it’s uninformed, but the other reason it bothers me is that it pits those who are pro-life against those who would advocate for the rights of immigrants. I like social justice, and I’m into women’s rights. I know that sometimes women, oftentimes very young women, get faced with a terrible choice and they are given a million reasons to choose abortion. I certainly understand that an unplanned pregnancy affects the rights of women in a much greater way than it affects men. It is our body that swells up, our feet that grow 2 shoe sizes and our bladder that never quite works properly again, not to mention our mental health that is subjected to the physical trauma of childbirth followed by an immense drop in estrogen coupled with months of sleepless night after sleepless night. I know that sometimes children can make education unfeasible and push women out of careers and into poverty. I know that if we take away the option of legal abortion, some women will still opt for illegal abortion, which may not be safe. But while I know all that, I still must accept that abortion is wrong. There go the other half of my Facebook friends. Dang it. My kids, last year, born and unborn. “Anchor babies.” Beloved children of God. Like I said, I’m into social justice. But who is more powerless – the woman, or the unborn child? The only question that seems truly relevant to me in this debate is whether or not the fetus is a living human being. As a mother, I can’t really fathom that my children were not living human beings until they reached the point of being able to exist outside my body, or until they exited my womb. I know that an egg can’t grow into a person, and a sperm can’t grow into a person, but put them together and, well, we all know how this works. And if fetuses are living human beings, how can we justify terminating them? In my opinion, with very few exceptions, we can’t. So it’s really hard for me to vote democrat. But it’s really hard for me to vote republican. Even if I find a candidate who is informed and sympathetic on immigration, I am afraid he or she will be swayed by a very noisy ideology. The very rhetoric of that ideology is offensive. To call someone an “illegal,” and to use it as a noun – as though that defines what a person is, that a person’s very existence is illegal – is to make their immigration status more important than their personhood. You are talking about someone’s family. You are talking about my family. Sometimes it seems like we’ve forgotten that these are also human beings. These are made in the image of God. And the problem with the image of the fetus and the immigrant child gangster, is that it’s kind of right. It’s telling me that if I want to vote, I have to make a choice, who would you rather keep? And how can I vote if I want my vote to reflect my values in a meaningful way, when our political system is so polarized and so rife with contradictions? I’m not asking that question just because I wanted to blab about my opinions (ok, I kind of wanted to do that), but I’d really like to know; How do you independent thinkers choose between two messed up ideologies? I’m not advocating for Christians to be apathetic about politics, or to stop voting, although I don’t actually think that would be super immoral or anything. But if you feel inclined to use your privilege to vote (which people have literally died for, after all) by all means, you should. But it should be done thoughtfully, and gracefully, and with full knowledge that God isn’t a Democrat, and God isn’t a Republican. But we don’t have to love Fox News’ reporting on immigration, right? Right??!! Thank you for being there. I have struggled with this very same irony this year. Immigration now has faces. They laugh, they cry, they fear, and they love my daughter. I don’t know how to vote anymore either. I am struggling to understand how the Christian conservative community has turned a blind eye to the plight of their neighbors, and even more horrified that I have done the same. Please forgive me. You are in my thoughts and prayers. Please pray for us too. Thank you so much for your comments. I think we all have an unfortunate tendency to turn a blind eye to the suffering of others until it starts to hit home – human nature! I’ll be happy to keep you and your daughter’s loved ones in my prayers.